Last time I was home in Greensboro, my mom, sister and I ventured to PF Changs for a late lunch. My order is usually pretty predictable (spring rolls are a must and why would anyone NOT want beef with broccoli?) but fortunately for me, my sister convinced me to try their lettuce wraps. I'm not going to lie. Those lettuce wraps were pretty bomb. Both sweet and salty, with a little bit of heat, and a subtle crunch of water chestnuts. Delicious! I immediately started to dissect the ingredients and I think my version is pretty close to the real thing. These lettuce wraps could not be easier to put together and make a great appetizer or main course (serves 4 as an app, 2 as an entree). 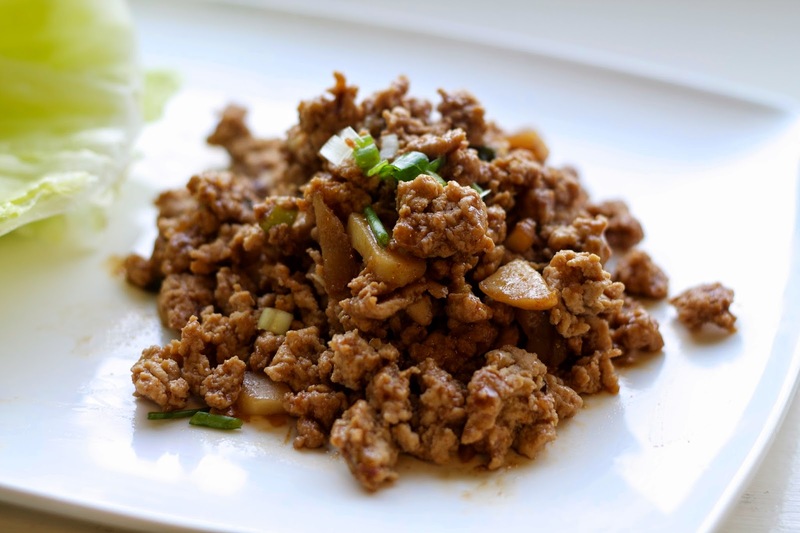 First, prepare the sauce by combining hoisin sauce, soy sauce, honey, ginger paste, and red pepper flakes in a bowl. Stir well to combine. Heat a large skillet to medium high. Add the oil and garlic and sauté until the garlic is fragrant (about 1 minute). Add the chicken to the pan and use a potato masher to break it up into small pieces as it cooks. When the chicken is just almost done, stir in the water chestnuts, half of the green onions, and the sauce. Reduce the heat to medium low and simmer until the chicken is done and sauce has just slightly thickened. Garnish with the remaining green onion and serve with lettuce leaves. These look amazing! I haven't tried their lettuce wraps but I have a PF Chang's close by so will have to try themand then make my own from your recipe! These are my favorite thing at PF Chang's, so I can't wait to try to make them at home!